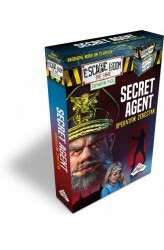 Home > Uitgevers > Identity Games International B.V.
Take the viral social experience of Escape Rooms to the comfort of your own home and for a fraction of the cost that you would pay! 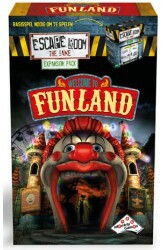 Included in this game are 4 unique 60 minute escape room puzzles that will test your cranial skills. Use images, gears, words, keys, shapes, maps and more to solve the three stages within each escape room. An analog timer on the Chrono Decoder centerpiece incessantly counts down, emitting ominous noises to create an environment shut out from the outside world. If the puzzles stump you for too long, slide a hint card into the Hint Decoder to keep your team moving. Slide 4 keys into the Chrono Decoder when you think you have the answer... but beware, if you're wrong, a precious minute will be taken from you. 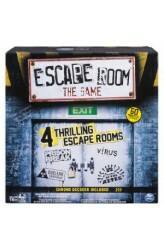 The 4 escape rooms vary in difficulty, designed.. Expansion for Escape Room: The Game. The last few years you traveled with your team from casino to casino, from Las Vegas to Monaco and from Atlantic City to Singapore. No trouble in sight till you get a disturbing phonecall in your shabby hotel room. Carolyn Castle broke the first rule of your styste: Never get Caught! .. 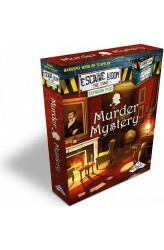 Expansion for Escape Room The Game. In this escape room you have to solve a murder case. Content: - 3 envelopes with game boards and various items - 8 hint cards You need the following parts from the base game: - Chrono Decoder - 16 keys - Hint Decoder - Rope from Nuclear Countdown room - Mirror (Virus) - Rules .. 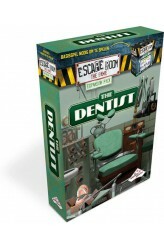 Expansion for Escape Room The Game. The new, selfnamed country of Zekestan holds the world in its grasp. Their show of power and threatening language about their secret weapon is absolutely frightening. The way in which the new President came to power seems only a small taste of what his sick mind is up to. There is only one way to stop him and you have to find that way with your team of specialists! If you are caught, any involvement by your government will be denied and you are on your own. And you know what they do with traitors in Zekestan ... .. 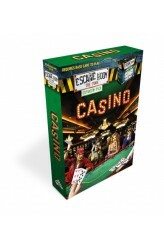 Expansion for Escape Room The Game. 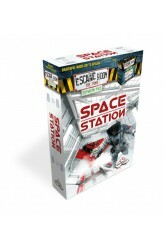 In this expansion you are on a mission in space. But after an explosion this dream became a nightmare. The oxygen reserve is enough for 60 minutes and your last chance is to take the escape -shuttle. But you don't know the password to enter it ... .. Expansion for Escape Room The Game. Dr. Siènski, your dentist, has invited you for a check-up. With some reluctance you have accepted his invite and you find yourself in his dentist chair. Before you know it he put a cap on your face. The last thing you hear is a the voice of Dr. Siènski, who says he is going to administer some laughing gas so you won’t feel any pain when he puls your tooth. Then everything goes black around you ... ..
Winnaar Speelgoed van het Jaar 2017! 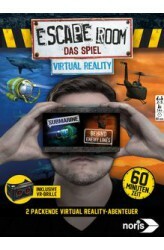 Escape Room The Game: de Virtual Reality editie. Deze editie kan met en zonder het basisspel gespeeld worden. Zet je schrap voor de ultieme Escape Room beleving! Ervaar de spanning en het mysterie van een echte Escape Room, gewoon bij je thuis. Ook bij deze zenuwslopende Virtual Reality editie van Escape Room The Game werk je weer samen met familie en vrienden. Alleen bevinden jullie je nu, dankzij de speciale VR-bril, ook echt in de Escape Room. Los de puzzels uit zowel het fysieke spel als de Virtual Reality-wereld op en kraak de code, voordat de tijd om is! Is de Virtual Reality editie je eerste kennismaking met het spel Escape Room the Game? Speel dan altijd eerst het intr..